How Rakeem Christmas's Caribbean roots made him a top NBA prospect. He had first lost Rob Murphy. The former Syracuse assistant turned Eastern Michigan head coach convinced Rakeem Christmas to spurn archrival Georgetown, only to depart the program prior to Christmas’s freshman season in 2011–12, before the promising frontcourt prospect had even set foot on Syracuse’s snowy, picturesque campus. Now he was losing Bernie Fine. After working almost exclusively with the Orange frontcourt players for 35 years, Fine was terminated on Nov. 27 amidst sexual assault allegations just six games into Christmas’s collegiate career. A McDonald’s All-American, Christmas developed a national reputation as a vaunted shot-blocker in high school. He still left much to be desired as a scorer, however, and now Syracuse head coach Jim Boeheim was entrusting Mike Hopkins, an assistant with 15 years of experience mentoring guards, with Christmas’s offensive development? “It was the type of deal where it’s, ‘Who’s my coach?’” Christmas told SI.com. ​For Hopkins, forging a relationship with the lanky big man from Philadelphia would be a daunting task. “It takes him some time to really warm up to people and show his personality,” said Amira Hamid, Christmas’s aunt. Born in Irvington, N.J., Christmas was two years old when he and his mother Landra Hamid moved to St. Croix to live with her extended family as she battled Lupus. At 28, Landra passed away from kidney failure when Rakeem was five. Boeheim never lacked confidence in Hopkins, who’s game-winning free throws against UConn clinched Syracuse’s 1992 Big East Championship. Hopkins, 45, has an inimitable ability to connect with players. 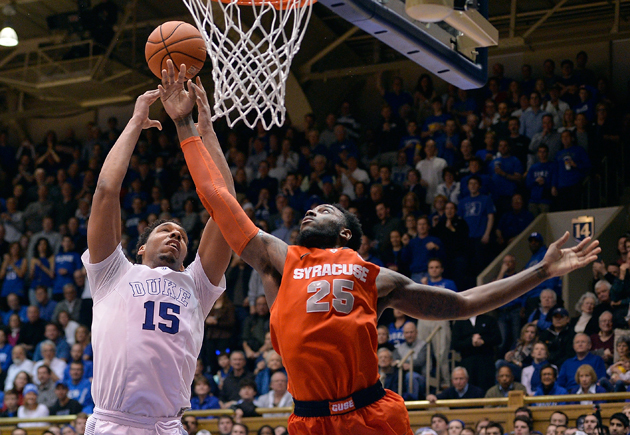 “He’s more of a high-emotional type of coach,” Boeheim said. The approach worked for Christmas, suddenly immersed in a college basketball hotbed just five years after first picking up the sport. Christmas spent his childhood under the care of his grandmother, fishing on the Virgin Island beaches and playing baseball wherever he could find a stick and a ball. He began playing in organized leagues in fourth grade, morphing into a prolific pitcher before he even reached middle school. Christmas mowed down opposing batters with endless fastballs He was named to the Virgin Islands National Team three times, only a lack of money preventing him for joining the team’s quest to qualify for the Little League World Series. As Christmas dominated on the mound, basketball fever infected all of St. Croix. Tim Duncan, the Virgin Islands’s native son, capped off consecutive NBA MVP awards by leading the San Antonio Spurs to the title in 2003. Duncan’s face graced billboards across the island, smiling down upon Christmas and his friends. After spending summers with his aunt in Philadelphia, Christmas grew tired of island paradise by age 13. He had sprouted to 6’4” and pitching drained his arm as he became claustrophobic of St. Croix’ tiny parameters, the island stretching just 29 miles long and only six miles wide. He finally convinced Amira to assume his custody after she graduated from Drexel, searching for an opportunity in the States to dabble in Duncan’s game. The first time Amira watched him play, Christmas ran the wrong direction from the correct basket and fumbled wide-open layups. ​ Now he was starting on the No. 5 team in the nation, protecting the rim as the backline of Boeheim’s 2–3-zone defense, playing his role on Dion Waiters and Scoop Jardine’s 2011-12 Elite 8 squad. Christmas stayed in his lane the next two seasons, waiting his turn behind Brandon Triche, Michael Carter-Williams, C.J. Fair and others before him. Each season presented an opportunity for growth, days and weeks and month inside Hopkins’s hardwood laboratory. After joining Boeheim on Mike Krzyzewski’s Team USA staff for the 2010 FIBA World Championships in Turkey and then co-head coaching the 2012 USA Basketball Select team in advance of the London Olympics, Hopkins translated his experience with the NBA’s best big men into his individual work with Christmas. Hopkins watched Tyson Chandler mature into a two-way catalyst. He observed Kevin Love befuddle defenders with his offensive repertoire. He aided the developments of Select team players like DeMarcus Cousins and Derrick Favors. ​Whenever he was on the court, so too was Hopkins. “A pastor told me a long time ago, ‘Kids spell love, T-I-M-E,’” Hopkins said. They perfected Christmas’s right- and left-hand half-hooks and drilled duck-ins and drop steps. Hopkins helped Christmas find the softness required on floaters and other common touch shots by NBA bigs. He would wallop Christmas with huge, orange and navy football pads to teach finishing through contact. Hopkins says their most important development was boosting Christmas’s confidence to be the primary option in Syracuse’s attack this past season. While he surprised the nation, Christmas and Hopkins expected his on-court explosion in 2014–15, his numbers skyrocketing to 17.5 points and 9.1 rebounds per game after averaging 5.8 and 5.1, respectively, as a junior. They had workshopped his offensive tool box—everything from a 15-foot jump shot to passing out of a double team—to prepare for Christmas’s absurd spike in usage. “It was like he’s learning Chinese on the go,” Hopkins said. “I knew the opportunity was there and I was just trying to have fun and just try to help my team win,” said Christmas. After losses this season, Christmas, sitting at the back of the silent team bus, would text Hopkins, assembled amongst the coaches at the front, venting about his mistakes during the game. Hopkins always told him to relax. They would watch tape, learn from it and go back to work the next day. “I’d get the ‘cool’ response, with emojis, the thumb up, the picture frames,” Hopkins said. At 23, a former baseball player once unable to convert a layup, now with a chance to sneak into the back-end of the first round, life is certainly cool for Landra Hamid’s only child.